The Energy Information Administration (EIA) released its weekly data on diesel and gasoline retail prices for the week ended February 6th, 2017. Both gasoline and diesel prices subsided for the fourth consecutive week, though the decline was minor. Retail prices had increased steadily during the month and a half following the November 30th OPEC meeting, but crude prices have been stagnant to declining over the past three weeks, and product prices have followed. As of today, crude and product prices have weakened further. If this trend persists, weekly average prices for the coming week will continue to fall. For the current week ended February 6th, diesel prices declined 0.4 cents to an average price of $2.558/gallon. PADD 1 retail diesel prices fell 0.4cts to $2.618/gallon. In New England, prices declined by a tenth of a cent to $2.661/gallon. Central Atlantic diesel prices fell 0.7 cents to average $2.763/gallon. Lower Atlantic prices declined by 0.2 cents to average $2.508/gallon. Overall PADD 1 prices were 53.1cts/gallon above their prices for the same week last year. 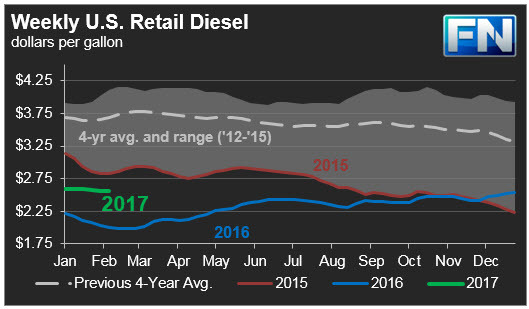 In the Midwest PADD 2 market, retail diesel prices fell 0.8 cents to average $2.492/gallon. This price was 56.3cts/gallon above its level for the same week last year. In the Gulf Coast PADD 3, retail diesel prices dropped by 0.5 cents, to average $2.403/gallon. This price was 50.7cts higher than in the previous year. Valero closed the 35 kbpd hydrocracker for repairs at its 300 kbpd Corpus Christi, Texas refinery. In the Rocky Mountains PADD 4 market, retail diesel prices declined 0.1cts to $2.515/gallon. This price was 60.1cts higher than in the prior year. In the West Coast PADD 5 market, diesel pump prices increased by 1.1cts, to $2.856/gallon. This price was 62 cents above its level last year. Prices excluding California rose 0.4cts to $2.748/gallon, which was 67.5cts above the retail price for the same week last year. California diesel prices rose 1.7cts to $2.944/gallon, 57.5cts higher than last year’s price. Prices were influenced by mechanical failure of one of the hydrocrackers (20 kbpd capacity) at the 77 kbpd Phillips 66 Rodeo refinery near San Francisco. Tesoro closed the 22 kbpd hydrocracker at its Wilmington California refinery. 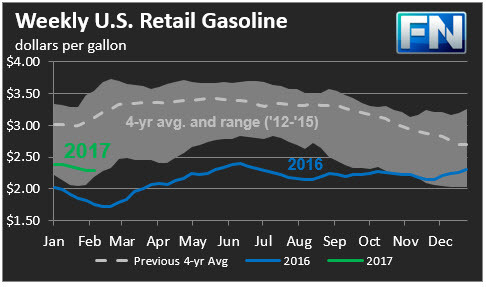 US retail gasoline prices declined by 0.3cts for the week ended February 6th, to $2.293/gallon. This price was 53.4cts higher than for the same week in 2016. In the East Coast PADD 1, prices for gasoline fell 1.9cts to $2.301/gallon. This price was 50.7cts higher than last year’s price. Prices dropped 2.0cts in New England to $2.294/gallon. Central Atlantic market prices fell by 2.6cts to $2.432/gallon. Prices in the Lower Atlantic market dropped by 1.4cts, to bring prices to an average of $2.206/gallon, 49cts higher than last year’s average price. PBF Energy reopened the 55 kbpd coker at its Delaware City refinery, which had been out of service since January 12th. Philadelphia Energy Solutions has had gasoline-related units offline, including a naphtha hydrotreater, cat reformer, and alkylation unit. In the Midwest PADD 2 market, gasoline prices increased 1.3cts to average $2.181/gallon. Gasoline pump prices were 66.3 cents higher than they were one year ago, the largest year-on-year price increase among the five PADDs. In the Gulf Coast PADD 3 market, prices fell 1.8 cents to average $2.071/gallon. Prices for the week were 51cts higher than for the same week in 2016. Supply was reduced by reduced runs at the 350 kbpd Valero Port Arthur refinery, which suffered a fire that the company reported as a minor event at its larger crud unit. The hydrocracker was in the process of being restarted. Phillips 66 also was forced to close the cat cracker at its 247 kbpd Belle Chasse Louisiana refinery to fix a leak. In the Rocky Mountains PADD 4 region, gasoline prices dropped 2.2 cents to average $2.233/gallon. This price was 48cts higher than at the same time in 2016. In the West Coast PADD 5 market, retail gasoline prices rose 2.2 cents to an average price of $2.70/gallon. This was 38.8cts higher than at the same time a year ago, whereas the U.S. average price was 53.4 cents higher year-on-year. Excluding California, prices unchanged at an average of $2.483/gallon. This was 47.1cts higher than at the same time in 2016. California prices jumped 3.4 cents to an average pump price of $2.825/gallon, 33.9cts higher than last year’s price for the same week. Los Angeles prices spiked 6.3cts to reach 2.926/gallon. This price was 29.2ts higher than the price for the same week in 2016. San Francisco pump prices increased by 1.8 cents to average $2.86/gallon, 37.4cents above last year’s price. Seattle prices decreased 1.7cts to average $2.727/gallon, 59.4cts higher than prices one year ago. PADD 5 prices were influenced by the closure of the 265 kbpd Tesoro Carson refinery near Los Angeles, caused by heavy rains. Coking and isomerization units were out of service. The restart has been initiated.